We offer Saturday, Sunday and evening Colorado Springs mobile notary service. Saturday and Sunday walk-in notary service is available at some locations in Colorado Springs. Most businesses are closed on the weekend, but a few Colorado Springs businesses offer Saturday and Sunday notary service. Some banks have branches inside grocery stores with Saturday and Sunday hours, including Saturday and Sunday notary service. Check with a bank located inside a Walmart, Safeway or King Soopers. On the weekend, we offer Saturday and Sunday notary service and will to drive to your home, work, office, hospital, nursing home, assisted living, or law firm, or meet you at Starbucks or McDonald’s. Saturday and Sunday notary hours are 8 am-8 pm. We provide mobile notary services for all types of documents. Please note: we may have other prior commitments on weekends, and do not guarantee Saturday or Sunday availability. There is an extra fee for Sunday notary or holiday notary service, in addition to the travel fee and notary fee. For less urgent matters, we are open for mobile notary service Monday-Saturday 8 am-8 pm. Note: During football season, we prefer to meet before or after the Denver Broncos game, or at halftime. Go Broncos! If you are looking for walk-in Saturday or Sunday notary service, there are some Colorado Springs banks and other businesses that list Saturday and Sunday hours and notary service on their website. Call ahead to make sure there is a Saturday or Sunday notary on duty. Also ask if they will notarize your particular type of document, and ask if they will notarize if you are not an existing customer. You will need to bring a current photo ID, such as a driver’s license. Note: business hours highlighted in yellow are open longer on weekdays and Saturdays than most walk-in notary locations. Sunday hours are highlighted in green. Many banks restrict notary services to bank customers only or bank-related documents only. Hours are subject to change at any time and holiday hours. Before driving, call ahead to make sure there is a notary available. Most businesses with walk-in notary service, including banks and shipping stores, close at 5 pm or 6 pm on weekdays, or earlier on weekends. We are open until 8 pm on weekdays and weekends and you can make an appointment to meet after 8 pm for Colorado Springs night time or 24-hour notary service. 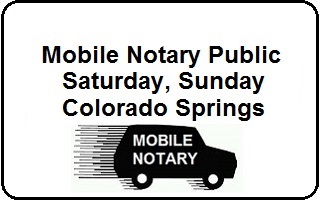 Please contact us for Saturday, Sunday or evening mobile notary service in Colorado Springs.